Millennium Madness: Fact or Fiction. Y2K - Help! Millennium Bug - Godzilla or Gnat? 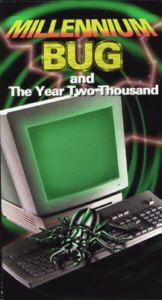 If you'd rather see, hear and revisit the problems ahead than read about them, "Millennium Bug and The Year Two Thousand", is just what the doctor ordered. A video for the time. Find out if the Y2K problem will upset the world economic system setting up a global cash-less system. Could a technological virus in the world's computer systems shake Western civilization to it's core? Has the federal government already anticipated the problems with a new "emergency government" to be imposed when the trouble hits? Is there a global cover-up in an attempt to avoid a panic? These questions and many more are answered in this eye-opening video by Ken Klein. "Millennium Bug and the Year Two Thousand" will awaken you to, and help prepare you for, the bombshell about to burst upon the world. This comprehensive study begins with "the problems" history (1960's Kobal computer language) and focuses on its cause and effect now. Not painting a pretty picture, government officials (including Alan Greenspan) warn of national power grid failures, air traffic shut-downs, satellites running amok and a 1929 type bank failure. Millennium Madness LLC and arrange for delivery. Allow 2 weeks for delivery. Cash, check or Money Order only. apparent as each new level is revealed. been suggested that 31 Dec 1998 is the real deadline! How does Y2K affect PC Computers? definitely go off unless it is defused. invalidated, or his system might lock up. becomes 1900 instead of 2000.
computer as opposed to someone else's. clock that says 1900 until they do. is rebooted, the correct century is reported. of the RTC BIOS service to update the century information. they are RARE. Y2K TEST will tell you if you happen to have one! Windows 95/98 will correct the year 2000 problem on systems that fail. But Windows 95/98 is based on DOS and DOS itself can have a problem. that must run in dedicated DOS sessions. run on the same system (ie multiboot), the problem MAY STILL EXIST. The BEST Y2K TEST Software can be had FREE! NOW! then you won't have a problem with THAT PC! The following is a TEST LOG. TEST ONE: Date rollover while system active..
Also see test FOUR for same tests with PC off! Y2K Outlook - What to do now? BIOS clock, when they mean the RTC, and others focus only on mainframes. Here at "Mellinnium Bug: Fact or Fiction", you will get the straight facts. What's a Thousand Years Between Friends? righteousness and happiness, esp. in the indefinite future. the end of the world. 2. a great and decisive battle. as a reference point for this mini-thesis. Judgement Day and Armageddon (and whatever follows) expected at that time. confirmation in the variety of Apocrypha available to them. greatly, even among themselves, as to the actual end of the millennium. Is it 2000 A.D.? Or is it 2001 A.D.? Or, it the correct dating 3 p.m.
this is no trivial matter in view of what we are attempting to date here. every educated person knows this, and almost no one ever thinks about it. birth of Jesus Christ, have been misdated by five whole years? Incredible! seemingly of little importance, but herein it becomes of ultimate focus. have been on Christmas Day 1995. I wonder how they explain that one? is no other data, either Holy Writ or Roman civil records. None. now ....... or later this afternoon.